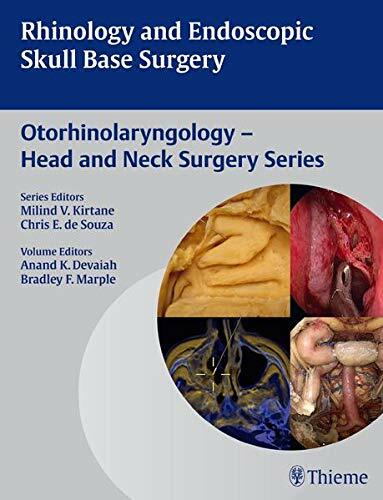 Written and edited by experts and pioneers in the field, Rhinology and Endoscopic Skull Base Surgery covers anatomic principles, applied physiology, medical principles, and surgical management of diseases affecting the paranasal sinuses and anterior skull base. Using evidence-based medicine and practical pathways, this text brings together the basic and clinical knowledge relevant to rhinology and endoscopic anterior skull base surgery. It is designed to be an accessible and essential text for residents and fellows as well as a key reference for practitioners. Key Features: Applied anatomy, embryology, and physiology of the paranasal sinuses and anterior skull base Cutting-edge technical information and surgical techniques for rhinology and endoscopic anterior skull base surgery Advanced concepts important to endoscopic skull base surgery, including the treatment of malignancies and extended endoscopic approaches Sections dedicated to comprehensive and multidisciplinary patient care, including open skull base surgery principles and radiation therapy strategies This textbook offers a wealth of valuable information that will enhance the practice of otolaryngologists, residents, and fellows as well as affiliated otolaryngology practitioners.